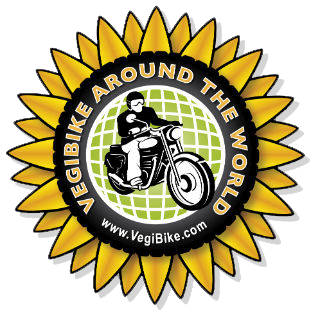 VegiBike, veg oil and diesel fueled engine, classic Royal Enfield motorbike by Harry Lyon-Smith: Neptune's Revenge. 22/23 June, Paralia, Greece. What was meant to be a 2 day, 3 night r&r has been extended by an extra day. Yesterday I either ate a funny squid, took on some seawater, or had too much sun. The result was a somewhat sleepless night ( best endured alone) and a considerable weight loss. Enough said. The extra day has been useful as I have been able to send all my camping kit to Sarah, my colleague in Australia. Now that I am at the end of Europe, and guest houses are the price of camping sites till I get to Auz, it makes sense . It amounted to 10 kilos, or a stone and a half. What with this, some other rationing of kit and my own lightening, Batty will have an easier job by probably 15KGs or 2 stone. It will also make her less top heavy, which has to be a good thing. Am going for Turkey tomorrow, and will cross the boarder if I get there in time, or first thing on Sat. BTW. The riddle of the furs has been explained, there are lots of Russians holidaying here and they are the market. I guess Greek fur is cheaper than Russian, or better. Who knows, but there are a hell of a lot of furs for sale, so I guess it is good business. It is Mark Abraham. Just wondering how your rear tyre is holding up and how many thousands of miles you expect to get out of it? PS: I never leave my email address on internet pages as I find it encourages spam.